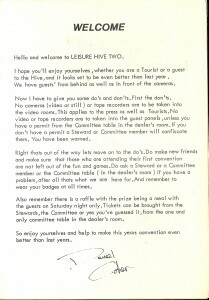 So my LonCon3 write up reminded me of a dim memory that I attended a Doctor Who convention in 1984. Turns out it was 1985, not 1984. Phew! I’m not old after all1. 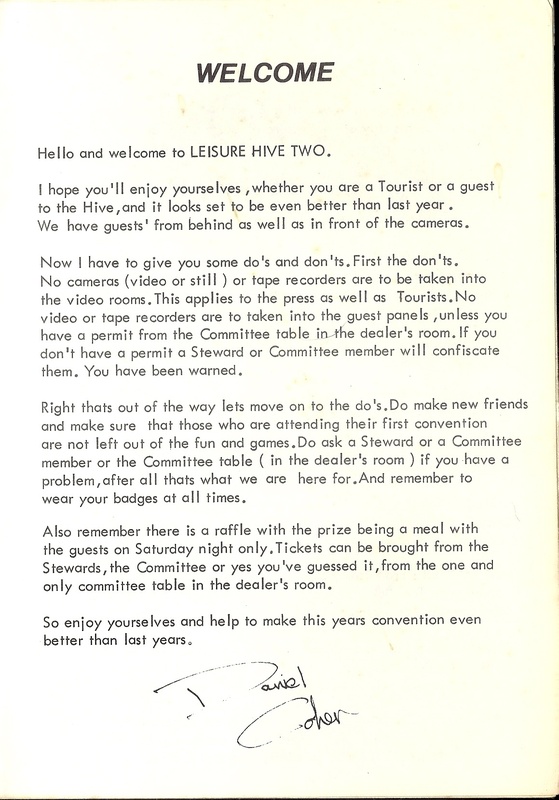 I was inspired to dig out the old convention guide, since I figured it might be of interest to about seven people on the internet. You can find some images of it below. 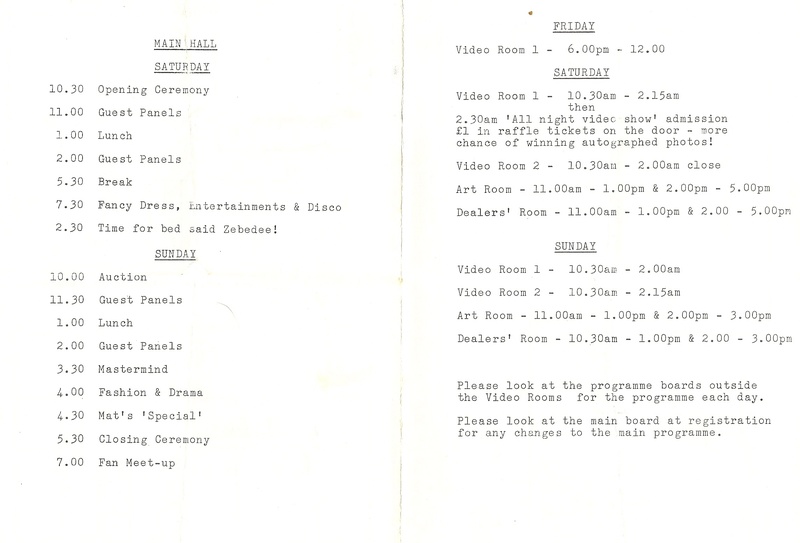 Now it has to be said that my memory of 1985 is somewhat hazy and my main recollection of this convention is falling asleep during a 37-part2 black and white story in the all night video room instead of going back to the B&B. 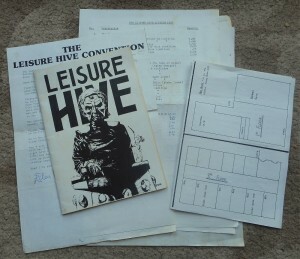 You have to remember that this was before I’d have seen much if any Who on videotape so I was probably only familiar with the ones I’d seen on air in the Seventies and Eighties (my earliest Who memory is Planet of the Spiders) plus whatever paltry repeats the BBC had deigned to show. 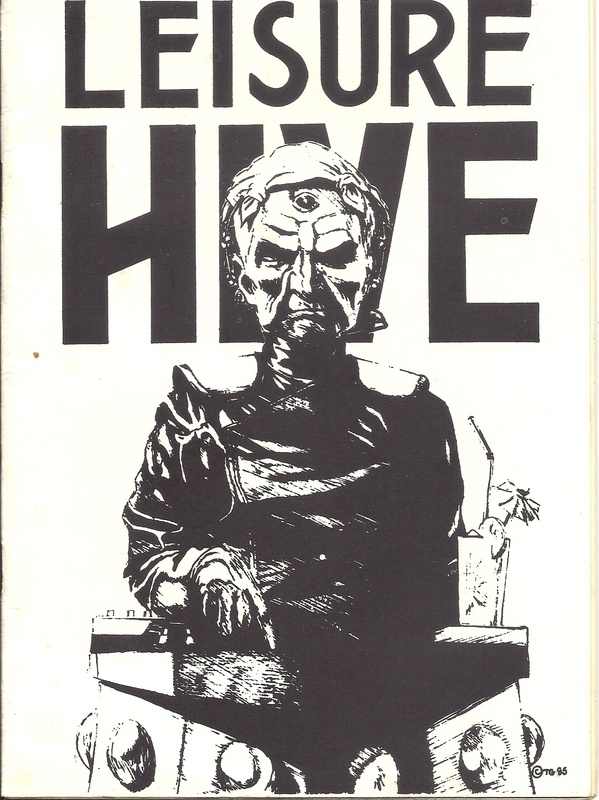 I knew the show’s past mainly from the Target novelisations, which I devoured from an early age and which I credit for getting me into SF. Actually watching honest to goodness old episodes was a proper novelty back then. 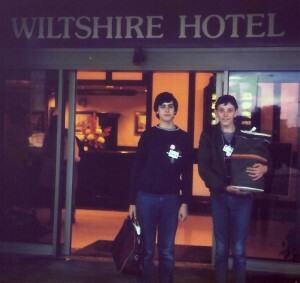 Here’s me (on the left of the picture) and my best friend Paul outside the Wiltshire hotel at the tender age of 16. 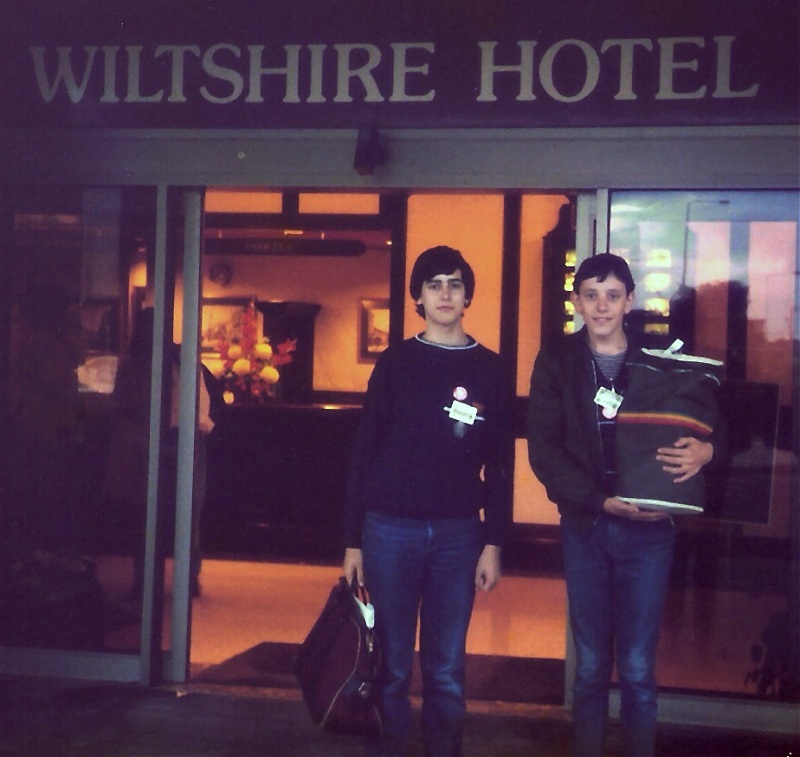 One of my first trips away from home without my parents, possibly the very first. Looking pretty sharp, I think you’ll agree. 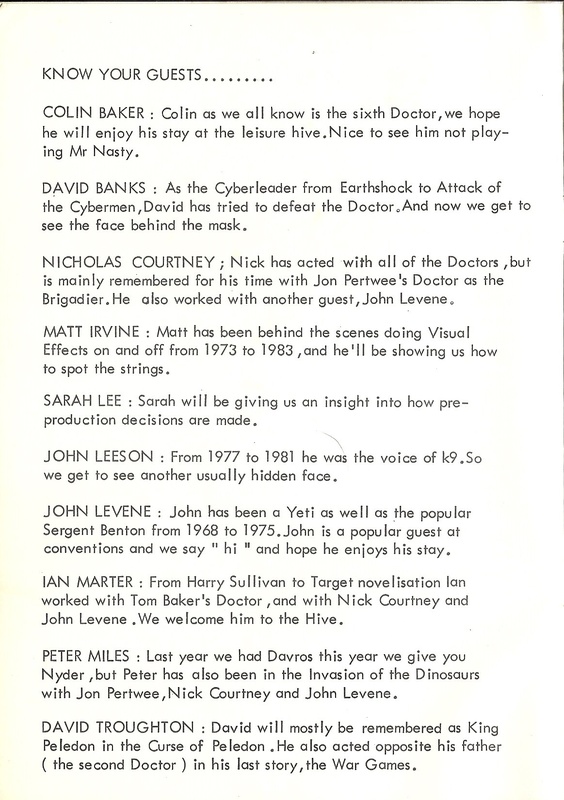 Below are some scans of the Convention guide. Click for larger versions. 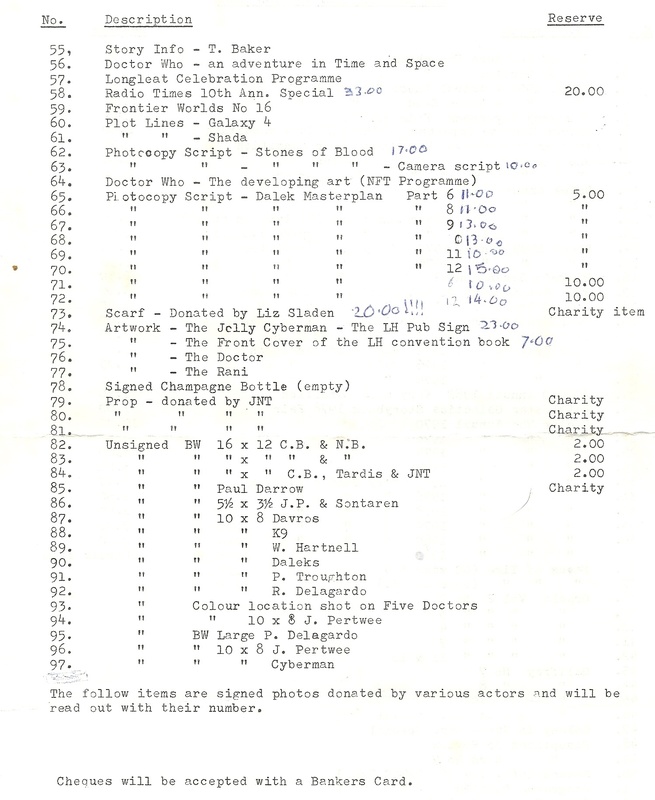 Next, the list of celebrity guests and the two day programme which ran from 24th to 25th August 1985, after Colin Baker’s first full season and during the long hiatus before ‘The Trial of a Time Lord’ aired a full year later. 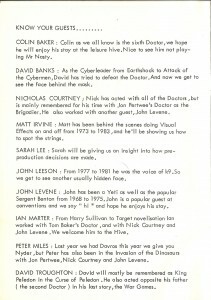 We were treated to Colin Baker, David ‘Cyberleader’ Banks, Nicholas ‘Brigadier’ Courtney, Matt ‘Special effects’ Irvine, Sarah ‘Production Team’ Lee, John ‘K-9’ Leeson, John ‘Benton’ Levene, Ian ‘Harry’ Marter, Peter ‘Nyder’ Miles, and David ‘Son of’ Troughton. I do remember seeing Matt Irvine, who is one of the few people I can readily identify in the panel photo below from his many appearances on Swap Shop and his amazingly ’80s fashion sense. (Again, click for a larger version). Is that John Levene leaning in on far left? Presumably that’s Peter Miles (Nyder) third from left. 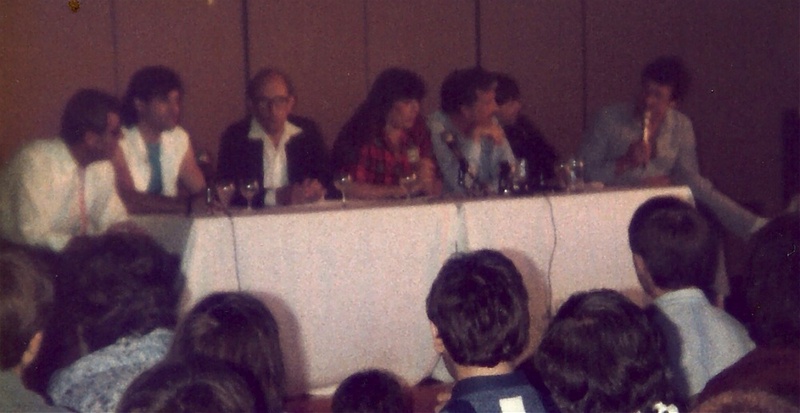 Ian Marter far right, maybe. Nick Courtney third from right? 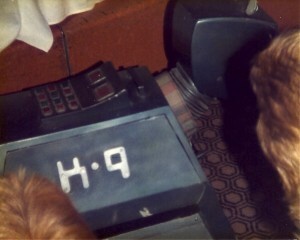 I also do remember seeing K-9, who I’m almost certain is the one in the middle of the second photo below. (Amazingly high quality pictures I think you’ll agree.) Strangely I have no recollection whatsoever of that Colin Baker bloke, who you’d imagine I’d have been at least slightly excited to see. I also took no other pictures of any interest whatsoever. What was I thinking? These days I’d have taken several hundred. 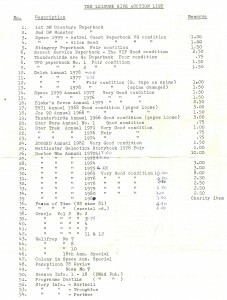 There was also an auction of memorabilia. Lots of premium items like tatty paperback books and annuals. On the second page you can see that I’ve written in biro what some of the sales went for. 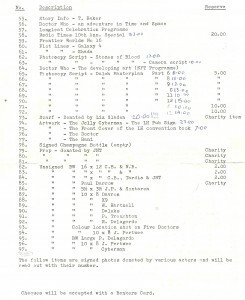 You’ll note that I was particularly impressed by £20 for a scarf donated by Liz Sladen. To be fair this was probably more money than I’d ever seen up to that point. It doesn’t say if it was screen-used, or just one she had in the back of a drawer. So there you have it. 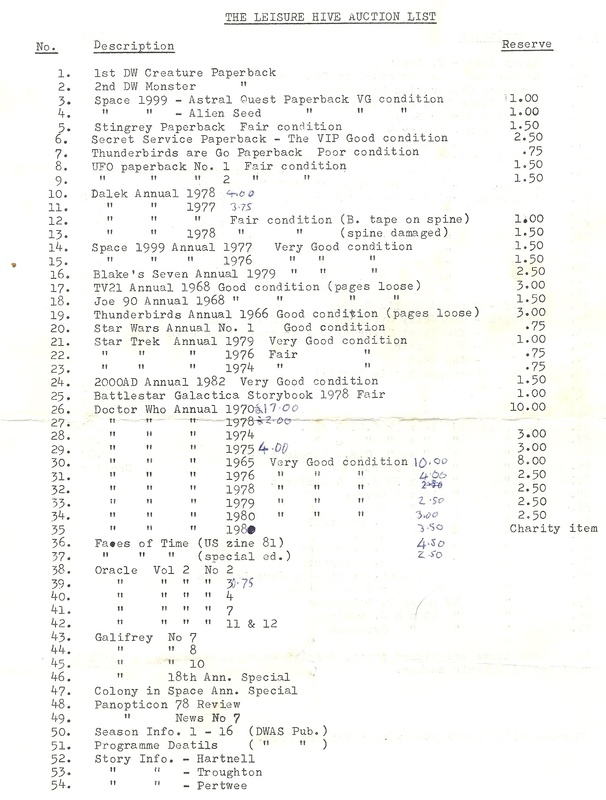 The least timely con report in Doctor Who history. EDITED TO ADD: Although the specfics of the con have largely left me (sadly for you the reader) what sticks with me is the huge sense of anticipation I felt. That feeling of connecting with the show. I’d been reading Doctor Who Monthly since issue 1, I owned The Making of Doctor Who, the Monster Book and all the other stuff I could lay my hands on, but being in the presence of people who actually made the show felt surreal. 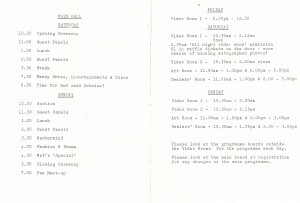 I’ve no idea how many attendees there were but it was a tiny and domestic affair compared to modern conventions. That hardly mattered to a 16 year old Doctor Who fan. My fandoms have considerably broadened since then, but the Doctor Who one has never left me. 1 I’m only fooling myself. I also attended this convetion. Happy memories. Previous Previous post: A Good Man? Next Next post: Into the Doctor?